Beneath the Feldip Hills, a new terror rises. The Order of Ascension - a group of misguided Guthix followers - are responsible for a spate of kidnappings. Little else about them is known - except that they must be stopped. Ocellus - a Guardian of Guthix - waits at the ruined chapel north-west of Oo'glog. He's seeking skilled slayers to venture into the undergroundMonastery of Ascension and take the fight directly to the Order of Ascension themselves. The Order of Ascension is made up of magical beings - each one a force to be reckoned with. You'll need 81 Slayer to enter the monastery, but that's just the start. A high Ranged level and the best ranging gear you can use are essential against even the weakest enemies you'll encounter therein. Their combat skills have been honed over millennia, and so have their tactics. There are five types of enemies within the monastery, each with a different combat purpose: for example, the gladii are mid-range damage dealers who charge into combat and stun, while the scutarii are heavily armoured, defensive units. They'll work together, too: the rorarii footsoldiers will team up, each gaining increased damage when they do, while the capsarii will support their comrades with defensive shields and healing. Most dangerous of all, though, are the legiones. These six entities are the leaders of the order, and each is a mini-boss fight in its own right. They're found in six laboratories throughout the monastery, each of which requires 95 Slayer and a keystone - dropped by the monastery's other inhabitants - to gain entry. The fights are instanced, and you'll fight alone unless you're paired up with a Co-op Slayer partner, who will have the option of entering the laboratory with you. Note: you can bring a Co-op Slayer partner into the laboratories even if they don't meet the 95 Slayer requirement, as long as you do yourself and are carrying the necessary keystone. The Monastery of Ascension is the ideal place to make use of the Co-op Slayer feature, as the tactics employed by the order mean that it really helps to have someone along for the ride. For example, the scutarii take greatly reduced damage when attacked from the front or sides, so having someone to keep them busy while you deal damage to their backs is invaluable. Shared potions and food - not to mention a friend by your side - is sure to help when you're facing down the Legiones! The monastery's a dangerous place, but the rewards are more than worth it. You'll find lore-filled pages of a book entitled History of the Order, which will give you insight into how the order came to be. The Order of Ascension also drop Ascension fragments, which (with 60 Fletching) can be used to fletch fragment bolts and arrows - ammunition which is particularly effective against them. Best of all, though, are the components needed to create the Ascension crossbow - the most powerful ranged weapon in the game. It requires level 90 Ranged to wield, can be converted between main and off-hand versions by Ocellus, and is the only weapon that can fire the mighty Ascension bolts, which can be fletched from items also found on the monastery's inhabitants, and level 90 Fletching. It degrades, and is repaired in the same way as Barrows equipment - by NPCs such as Bob in Lumbridge, or at a player-owned house armour stand. For information on how to make the crossbow, speak to Ocellus. 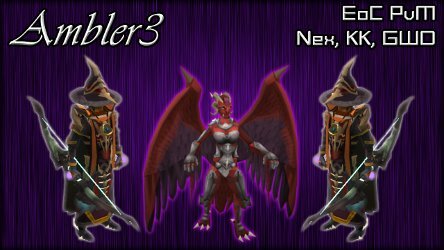 Duradel, Lapalok and Kuradal can each give out slayer assignments for Order of Ascension monsters. The entrance is within the ruined chapel north-west of Oo'glog, close to the Yanille lodestone. Level 81 Slayer to enter the monastery. Level 95 Slayer to enter the laboratories and face the legiones (or a Co-op Slayer partner with that level). Level 160 Combat (in addition to 81 Slayer) to be given Order of Ascension slayer assignments. Keep your eagle-eyes peeled for some awesome ranger-centric items on the Squeal of Fortune this weekend: the white stag bow, the skirmisher armour, and fletching skill crates! Raw fish can now only be removed from a tackle box through a bank. The tackle box also has a new ability: you can teleport an amount of raw fish per day, directly from it to the bank. Finally, the tackle box now has options to deposit raw fish from it straight into the bank, and to empty raw fish into the inventory when viewing the bank interface. The area in which it is possible to teleport away within the Wilderness has been changed, to reflect how it was pre-Evolution of Combat. The level 20 area is now level 26 Wilderness, and the level 30 area is now level 40. The Zaros emisssary now has a purple staff instead of a red one. Players yet to complete Ernest the Chicken will find that he has been regrown to normal size. God-books now stay attached to your hip while woodcutting. Several NPC skin tone issues have been fixed. Odovacar’s arms have now been reattached to his body. Sheathed Lucky godswards now display the correct model. Wyson now wears his gloves correctly. A graphical issue with flared trousers has been fixed. White chainbodies no longer stretches on female characters. 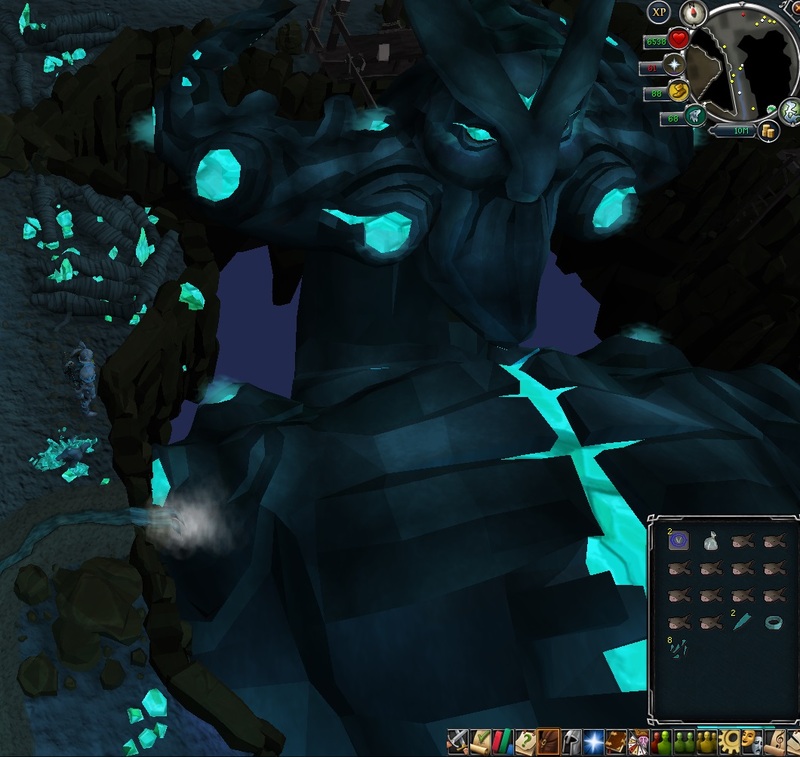 Players now perform a slicing animation when slicing open dung kalphites. Profound platebodies no longer clip with capes. Morytania legs 3 now appear correctly when fishing. Some model stretching issues with the stegoleather and megaleather shields have been fixed. A graphical issue for females wearing subjugation robe bottoms has been fixed. The Culinaromancer's gloves 7 inventory icon has been made slightly larger. The model of the monk robe has been adjusted to stop it clipping with a skill cape. Part of the faces of several characters are no longer missing. The Elf dress no longer reacts oddly to sheathed weapons. Nurses hats no longer float above players heads. The cheongsam and pharaoh tops no longer stretch on female players. Players can now sheath the yaktwee stick. Vannaka's armour and sword have been updated. Some adjustments to the citharede robe tops have been made to prevent them clipping with capes. The quest cape no longer clips with superior tetsu armour. The chat head model of Akrisae's hood has been adjusted. Players' eyes have been realigned when wearing their hair in a falcon hair style. The mystic air staff now keeps it particle effect when sheathed. Doris no longer has different colour hair rollers to her chathead. Drinking Summoning potions now plays the correct animation. Torva platebodies no longer intersect with divine spirit shields. The staff of air that Al Shabim has equipped has been updated. Players can now use jangerberries on a guam vial in the Watchtower quest to mix the potion. The Burthorpe/Taverley Mission Accomplished task can now be completed. The Clan Wars caller function now works as intended. Premium pets can no longer be taken into Mobilising Armies games. The Crucible list of Supreme Champions now fits to the size of the list and the number of Supreme Champions has been reduced. The bank chest under Lumbridge Castle now has a 'collect' option for the Grand Exchange. The Berserk ability has been tweaked to enable NPCs to deal more damage against players. It now also only increases damage taken by 50% instead of 100%. The off-hand exquisite weapons on the Squeal of Fortune have been made members only to be in line with other duel wielded items. Bonus equipment no longer gives bonus XP for God Emissary tasks. Players at a certain stage in the Wanted! quest should now be able to obtain message fragments from Black Knights for their god emissary. Fist of Guthix reward shields have been restatted to better reflect their defence requirement. Players are no longer teleported onto the Nexus after talking to Zandar Horfyre in the Dark Wizards tower. Kurasks can no longer be attacked with spells other than Slayer Dart whilst wielding the Slayer's staff. Abyssal demons no longer stop taking damage from a channelled ability after teleporting. Flight Kilisa and Flockleader Geerin now increase the Armadyl kill count in the God Wars Dungeon once again. An additional bovistrangler staff entry in the magic skill guide has been updated to state bovistrangler wand. A small wording error has been corrected at the Artisans Workshop. The arcane capacitor now works as intended. An issue where some players could not get past page three of their POH toy box has been resolved. The Group teleport to Trollheim spell now has the correct level listed in Magic Skill Advance Guide. The Make-x interface no longer shows that you will get Crafting xp after teleporting any of the cooking urns. The XP gained for crafting hide and magic shields in Dungeoneering has been corrected. Curious how difficult it will be without a Co-Op slayer partner. Is the dungeon on task only? *facepalm*, now I can destroy all that garbage. Scutarius tactics: Stun and run behind them to get rid of the damage reducer. The bolts are very easy to obtain, the shards that are crafted into ascention bolts are a 100% drop. Someone in the Jagex Art Department has really fallen in love with that bluish glow, haven’t they? Wow. Died in 3 seconds to sextus - think I was too slow on the mage prayer or something. The minions are quite easy to kill, and keys don't seem too uncommon. ...? I really should not be surprised at this point, but I am. Another thing nerfed to the point of useless, for no reason.